Yesterday Laura Ann gave me the best birthday present: we spent the day getting massages at Bliss SoHo, picking up baked goods, and eating at Peasant. 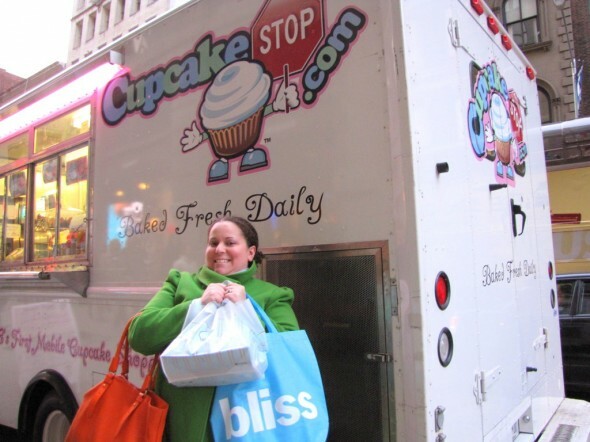 The Cupcake Stop truck was parked up the street from Bliss. So after LA and I were transformed into gobs of putty and spent an hour in the Bliss lounge chilling out, I needed to go. I’ve been stalking them on Twitter since they opened in 2009. I got the mini cupcake sampler, and Adam and I are still eating them. They are so frakking good. It’s been a great few days. Laura Ann and I went up to the Catskills to the Emerson Resort and Spa. We walked around Woodstock, we ate good food, we tried to fish (need a license) and meet a tame bear (but he’d retired). We saw the world’s largest kaleidoscope, which is actually the trippiest thing I’ve ever experienced. Ever. But most importantly, we spent a whole morning at the spa getting scrubbed, buffed, cleaned, polished, and massaged into putty. It. Was. Fabulous. All Hail Orange Skye Massage Therapists! Everything they say about new teachers catching every bug in the building is true. Echinacea, Vitamin C, apparently it doesn’t matter how preventive you get. I’ve worked around kids for a while, and every new set of kids has a new set of germs to catch. Fun!